Veteran Dutch box pest, Vincent Koreman a.k.a. 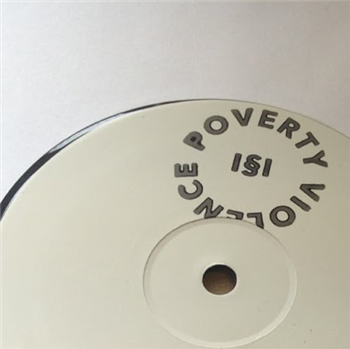 Drvg Cvltvre doses the Poverty is Violence with its debut shot of grimacing slow techno and new beta audness. After outings on a host of international imprints, 'The Right Knife in the Right Back' marks up some of Drvg Cvltvre's most potent material, bar none. A-side he really gets under the skin and works dem bones with the slow, banking throb and sickening subbass of 'Drone Strike' really puts his back into the welting industrial pressure of 'Computer Controlled'. On the other, Specter gives 'Drone Strike' a colder overhaul freezing its patterns with a rictus Chi funk, leaving Koreman to grind out the slowly demented tattoo of 'You Will All Die Alone and Unloved'. Hand-stamped vinyl 12". Limited to 300 copies.